Preheat oven to 350°F. In a large pan, sauté in oil onion, squash, zucchini, mushrooms and garlic. Cook until squash and zucchini are softened but not mushy. Reduce heat. Add in tomatoes, Italian seasoning, basil, salt and pepper. In a bowl, mix together egg, cottage cheese and ¾ of mozzarella cheese. 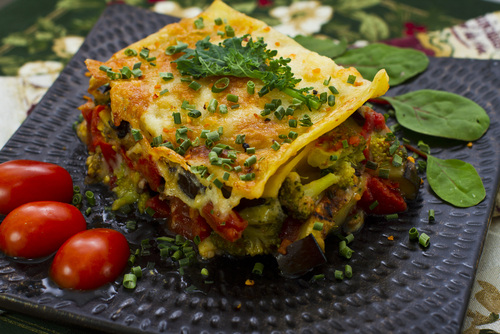 In large glass baking dish, layer as follows: Place a small amount of sauce and vegetables on bottom, top with noodles over sauce (single layer) until covered, cover noodles with some of the cottage cheese mixture (not too heavy), and cover with more sauce and vegetables. Repeat this sequence until all sauce, cheese mixture and noodles are used. Dust top layer with the remainder of mozzarella cheese. Bake covered for 30 minutes. Uncover and bake an additional 20-30 minutes until noodles are soft and cheese is melted and slightly browned on top.